Edited by Paul D. Miller (aka DJ Spooky that Subliminal Kid) and Svitlana Matviyenko. The MIT Press, 2014. Mobile apps promise to deliver (h)appiness to our devices at the touch of a finger or two. Apps offer gratifyingly immediate access to connection and entertainment. The array of apps downloadable from the app store may come from the cloud, but they attach themselves firmly to our individual movement from location to location on earth. 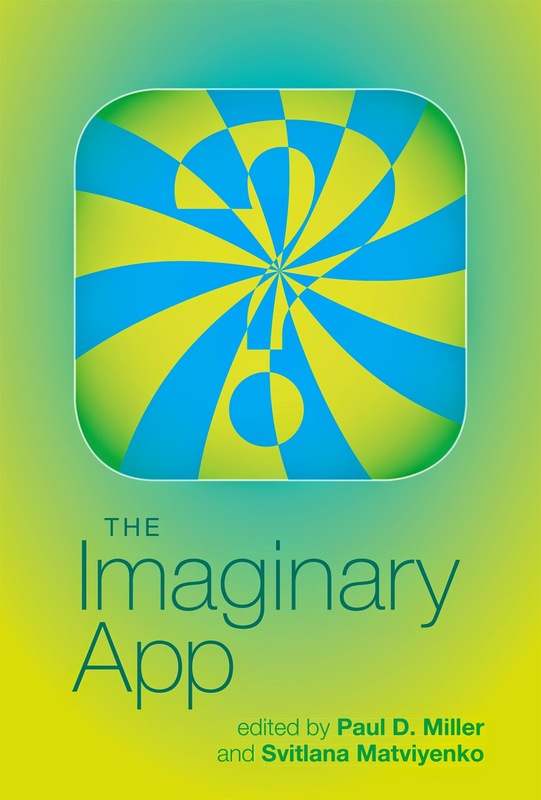 In The Imaginary App, writers, theorists, and artists--including Stephen Wolfram (in conversation with Paul Miller) and Lev Manovich--explore the cultural and technological shifts that have accompanied the emergence of the mobile app. These contributors and interviewees see apps variously as “a machine of transcendence,” “a hulking wound in our nervous system,” or “a promise of new possibilities.” They ask whether the app is an object or a relation, and if it could be a “metamedium” that supersedes all other artistic media. They consider the control and power exercised by software architecture; the app’s prosthetic ability to enhance certain human capacities, in reality or in imagination; the app economy, and the divergent possibilities it offers of making a living or making a fortune; and the app as medium and remediator of reality. Also included (and documented in color) are selected projects by artists asked to design truly imaginary apps, “icons of the impossible.” These include a female sexual arousal graph using Doppler images; “The Ultimate App,” which accepts a payment and then closes, without providing information or functionality; and “iLuck,” which uses GPS technology and four-leaf-clover icons to mark places where luck might be found. Christian Ulrik Andersen, Thierry Bardini, Nandita Biswas Mellamphy, Benjamin H. Bratton, Drew S. Burk, Patricia Ticineto Clough, Robbie Cormier, Dock Currie, Dal Yong Jin, Nick Dyer-Witheford, Ryan and Hays Holladay, Atle Mikkola Kjøsen, Eric Kluitenberg, Lev Manovich, Vincent Manzerolle, Svitlana Matviyenko, Dan Mellamphy, Paul D. Miller aka DJ Spooky That Subliminal Kid, Steven Millward, Anna Munster, Søren Bro Pold, Chris Richards, Scott Snibbe, Nick Srnicek, Stephen Wolfram. The Software Studies series publishes the best new work in a critical and experimental field that is at once culturally and technically literate, reflecting the reality of today’s software culture. The field of software studies engages and contributes to the research of computer scientists, the work of software designers and engineers, and the creations of software artists. Software studies tracks how software is substantially integrated into the processes of contemporary culture and society. It does this both in the scholarly modes of the humanities and social sciences and in the software creation/research modes of computer science, the arts, and design. Dr. Noah Wardrip-Fruin, The University of California, Santa Cruz (UCSC). Dr. Lev Manovich, The Graduate Center, City University of New York (CUNY).